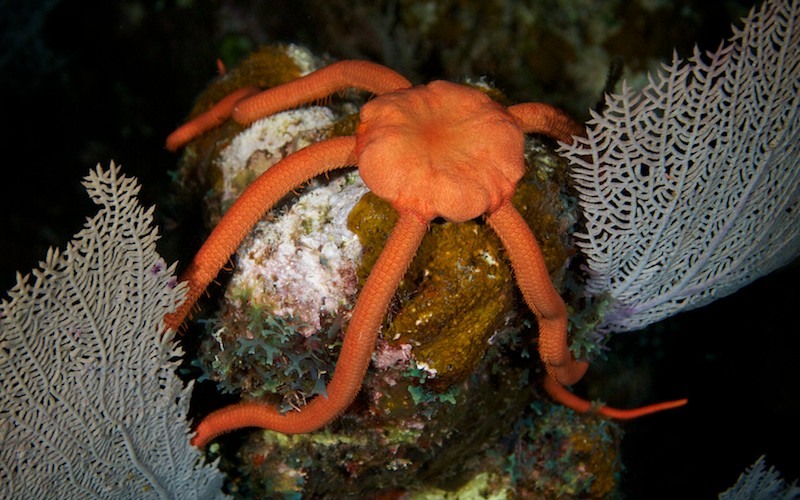 Caption: Brittle stars or ophiuroids are echinoderms in the class Ophiuroidea closely related to starfish. They crawl across the seafloor using their flexible arms for locomotion. The ophiuroids generally have five long slender, whip-like arms which may reach up to 60 centimetres (24 in) in length on the largest specimens. They are also known as serpent stars. Ophiuroidea contains two large clades, Ophiurida (brittle stars) and Euryalida (basket stars). Many of the ophiuroids are rarely encountered in the relatively shallow depths normally visited by humans, but they are a diverse group. There are some 1,500 species of brittle stars living today, and they are largely found in deep waters more than 500 metres (1,650 feet) down.